Pest description and crop damage The strawberry crown moth is an insect native to the PNW and has caused damage to strawberries in the northern Willamette Valley. 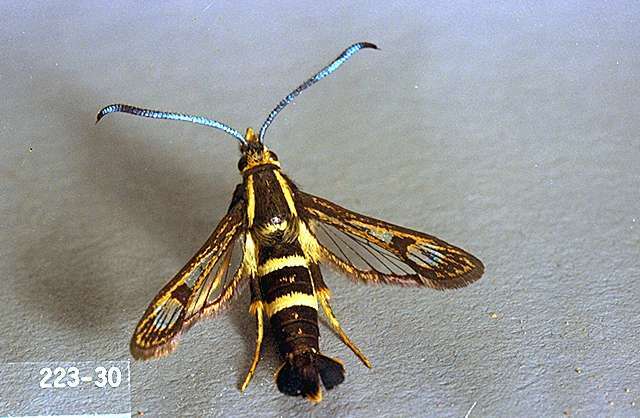 The adult strongly resembles a yellow jacket; it is about 12-15 mm long, black with yellow markings. The eggs are brown, oval, sculpted on the surface, and distinctly cupped on the sides. The larvae are white with a brown head, and 16-25 mm long at maturity. Larvae feed on the crown and root tissue of the strawberry plant. This feeding provides entry points for root pathogens. Injured plants are stunted, may produce reddish foliage, and yield poorly. 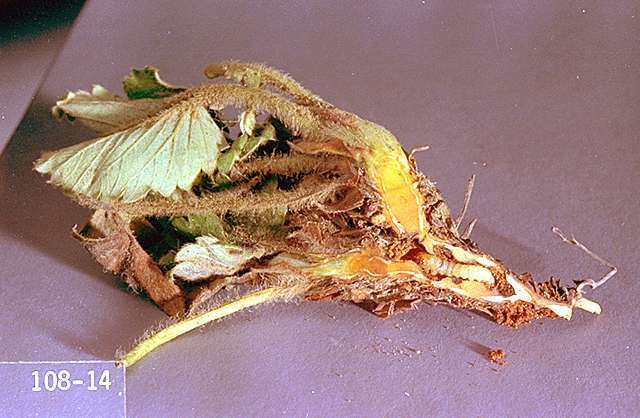 Tops of damaged plants are easily separated from the root system if pulled on, which quickly distinguishes this damage from that caused by root weevils. Damage is sporadic and has been most severe in Washington County, Oregon. Biology and life history The insect overwinters in the crown of the strawberry plant. They become active in April and May and feed for a short time before pupating. Adults emerge in late June and July, mate, and lay eggs on leaves near the base of plants. The young larvae feed on the outside of the crown before boring deeper into the crown to feed and overwinter. There is one generation per year. Sampling and thresholds Pheromone traps are available to monitor the emergence and flight of the moths. No commercial strawberry varieties resistant to SCM are available. Untopped strawberry plants can serve as trap plants. If plants are topped before the moth's flight period, a few rows should be left untopped. 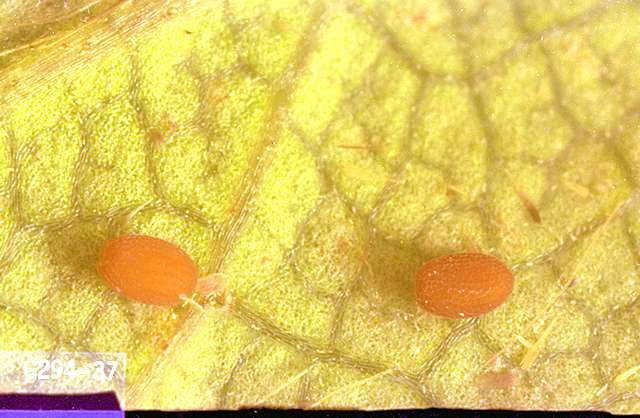 Egg-laying females are attracted to and deposit a significant portion of their eggs on the untopped plants. These untopped plants are then disked under in the fall. Remove infested plants. Infestations usually begin near field borders and damaged plants occur in clumps. These plants are stunted and develop a reddish color earlier in fall than uninfested plants. Remove and destroy these plants. Replant to fill the gap. Do not place new plantings adjacent to infested fields. Grain planted between a new field and an infested field can serve as a barrier to the flight of the adult moths (they are low flyers), thereby preventing infestation of the new field. Plow out infested fields in August, September, or October. Thorough shredding of all roots and crowns followed by deep plowing is necessary to kill the strawberry crown moth larvae and pupae. In home gardens, on June-bearers, complete removal of the old leaves with hedge shears or similar equipment will remove any eggs and induce a flush of fresh leaves. Chemical control of this pest has not proven effective and is not recommended. 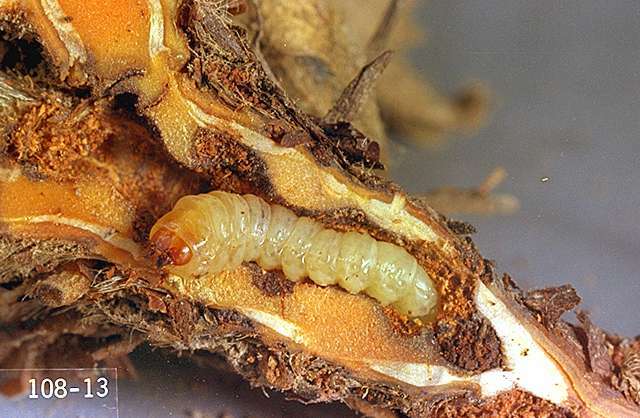 Crown moth larvae are well established in strawberry roots and crowns by mid-August; applying insecticides to control this pest is not recommended after the first week in August. chlorpyrifos (Lorsban) at 0.94 lb ai/a. Apply immediately after last harvest, after topping plants. Apply in at least 100 gal water/a as a high-pressure spray to saturate crowns. Do not exceed two applications per season. PHI 21 days.